The report says Hezbollah leader Hassan Nasrallah -- seen here in 2010 -- met with members of Shiite organizations in Bahrain. 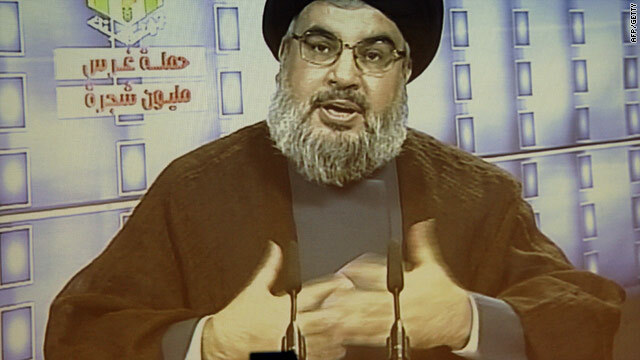 Washington (CNN) -- The militant group Hezbollah is actively plotting with the opposition in Bahrain to overthrow the country's ruling family, the government said in a confidential report to the United Nations. "Evidence confirms that Bahraini elements are being trained in Hezbollah camps specifically established to train assets from the Gulf," the report reads. Bahrain has long made claims that Iran and Hezbollah have sought to fuel instability in the nation. In the report sent to U.N. Secretary-General Ban Ki-moon, Bahrain's government claims that Iranian-backed Hezbollah has been training opposition figures at its camps in Lebanon and Iran in an effort to destabilize the Khalifa monarchy. The report also says the militant group has trained militants for activities in neighboring Gulf countries, according to diplomats who have reviewed it. The government report urges the United Nations to curb Iran and Hezbollah's interference in the country. Both Iran and Hezbollah have previously denied involvement in the protests. The Bahraini government has launched a violent crackdown against the protesters, and Saudi Arabia and the United Arab Emirates have deployed troops to Bahrain to support the regime. The report details meetings between Hezbollah leader Hassan Nasrallah and other senior officials of the group with members of Shiite organizations in Bahrain, such as Wefaq, one of the country's major opposition parties, and the banned Haq group. In the report, Bahrain alleges that Shiite groups coordinated political strategy inside the country and used Hezbollah's television channel, Al-Manar, to mobilize opposition protests. Abdul-Jalil Khalil, a Wefaq member of parliament, denied the claims. "We believe the problem is a political issue and an internal issue, and we have no support from the outside," he said, adding that Wefaq has no formal or informal relationship with Hezbollah and does not use Al-Manar to aid the movement. "The movement is a peaceful movement," according to Khalil, who said Wefaq is interested in serious political reform and not in overthrowing the ruling family. Hassan Mushaimaa, the secretary-general of Haq, has been detained and was unavailable to comment on the report. Bahrain's ruling Khalifa family is Sunni Muslim, but about two-thirds of the country's people are Shiite. The State Department has said it believes that Iran's role in Bahrain has been minimal and that the protests in Bahrain were the product of home-grown frustrations of the country's Shiites, who want greater economic and political participation. A U.S. official said Iran would "like to meddle if it could," but there is "no evidence they've been able to do much." The opposition in Bahrain is huge, and the protests began without Iranian organization or involvement, the official said. Iran has contact with some in Bahrain and might give "some advice," but that's all, the official said. The Obama administration has criticized the Bahraini crackdown and called for the government to enter political dialogue with the opposition. CNN's Jenifer Fenton and Pam Benson contributed to this report.